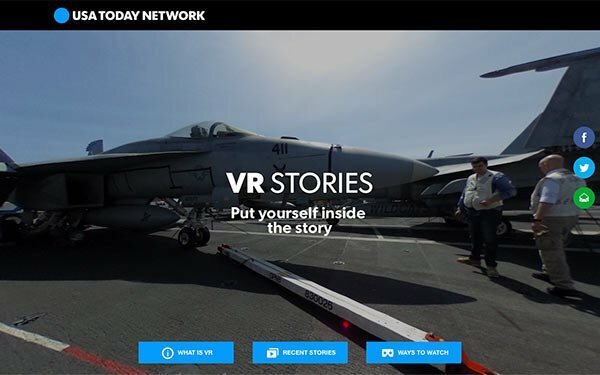 For the past three years, the USA Today Network has been looking to a future where VR and AR enhance news coverage, marking a marriage between reporting and technology. Delving into the world of VR just four years ago, Ray Soto, USA Today Network’s director of emerging technology, has turned what was once an experiment into a fully-fledged part of the network’s editorial offerings, deepening reader interaction across platforms. The emerging technology team used “Harvest of Change,” its first public VR venture, which took readers to a fourth-generation farm in rural Iowa, to learn about engagement. It was also a lesson in how to structure a narrative experience and become more interactive. According to Soto, his team was able to track user engagement and session time across each new VR experience, allowing them to understand how people approach story telling within the technology. “Blue Angels,” a 360 degree video that took readers aboard a Blue Angels jet, recorded more than 20 million views across platforms and was picked up by Mark Zuckerberg as an example of great immersive storytelling. Rather than an in-and-out design to allow users to move through the virtual world as they had with “Eisenhower,” “The Wall” was built as a book of sorts with four chapters that users could jump between, engaging with the content that was most interesting to them. Since entering the realm of VR and AR, the USA Today Network has received an Edward R. Murrow award for “Harvest of Change,” which won the foundation’s first “best use of technology in journalism award,” and a Pulitzer Prize for its groundbreaking project “The Wall,” which featured content across all platforms from USA Today papers Arizona Republic, AZCentral, Desert Sun, El Paso Times, Las Cruces Sun News and Caller Times. “321 Launch” found the team again collaborating across USA Today Network’s newspapers, this time with Florida Today. The app took users inside the launch of a SpaceX rocket at Cape Canveral Air Force Station by allowing users to set their phone up on any flat surface to watch the 3-D digital rocket soar. Over the course of its experiments, USA Today has also created branded content for Honda and Toyota, a sponsor of its VR series Virtually There. Soto believes the foundation the company is building now will make it a valuable asset to advertisers looking to take advantage of AR-compatible content in the future, though the technology isn’t quite there yet. Advertisers are interested in telling new stories through new experiences, and we’re still working toward that with augmented reality We’re focusing on interactivity to be able to tell stories not just on the editorial front, but also from an advertising perspective,” he adds.